Celebrate the San Francisco Giants and their World Series victory! The sky filled with orange and black confetti as the players, coaches, families and all members of the Giants organization made their way down infamous Market Street to the orange and black festooned City Hall. The sidewalks were filled with fans wearing orange and black. Everyone was happy and celebrating. How thrilling to see the City by the Bay – diverse and unique – united in such a happy moment. PowerHiking is reminded that in our differences and in our diversity there is strength. Working together is a lesson to be learned from this joyous occasion. How fitting for the ceremony to end with Tony Bennett singing “I Left My Heart In San Francisco”! Under the orange glo of City Hall, thousands of San Francisco fans celebrated their San Francisco Giants win the World Series. Across the city there was a glo of orange – Coit Tower, tops of buildings and the iconic palm trees at AT&T Park. Willie Mays Plaza was filled with fans as the orange lights around the trees glowed over them. PowerHiking celebrates the Giants and is looking forward to the parade on Wednesday. PowerHiking is excited about the San Francisco Giants and the World Series. Everywhere you go there is orange. Iconic buildings like Coit Tower and City Hall glow with orange lights at night. Even the tops of downtown high rise buildings are glowing orange as well. In Willie Mays Plaza at AT&T Park the signature palm trees are ablaze with orange lights. It is exciting to see the City by the Bay coming together and enjoying the season. With bridge to bridge views of San Francisco, Angel Island is a gem in the middle of San Francisco Bay. There are wonderful walks, a five mile road circles the island, and there are side roads to restored barracks. Exciting trails climb to the top of Mt Livermore for awesome views. You can swim at the beach or just relax at one of the fun picnic areas. The Golden Gate Bridge is on one side and, beyond Alcatraz, the Bay Bridge and the City on another. 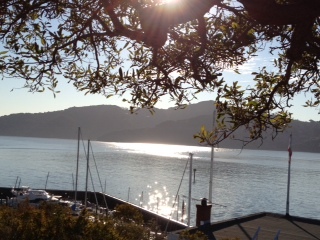 To yet another side are views of Mount Tam in Marin County and the quaint town of Tiburon. The East Bay and Richardson Bridge are in another direction. Angel Island is the perfect location for views of the entire Bay. Since the time of the Civil War, Angel Island has either been the site of military protection of the entrance to San Francisco Bay, a station for immigrants coming from across the Pacific Ocean, or a military fort and staging area. Today it is part of the National Park System to be enjoyed by everyone. It is easy to get to by ferry boat from Pier 41 or on the Angel Island Ferry departing from Tiburon. 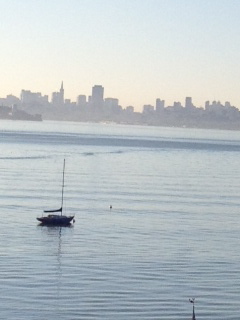 PowerHikers loved our day on Angel Island and, in spectacular weather, it cannot be beat. The San Francisco Bay is sparkling in the sunlight. Beautiful warm weather in San Francisco is the time to get out and enjoy the City! Take a walk along the Lands End Trail – beautiful on such a clear, warm day. Venture down to The Cliff House and Ocean Beach. Usually windy and cold, today is the type of weather to really enjoy the beach. Sutro Heights Park is another idea for spectacular views. And then there is Golden Gate Park and, of course, the Embarcaero and Crissy Field. Have a great day enjoying the sunshine. We will be out there. Hope to see you! You are currently browsing the Powerhiking's Blog blog archives for October, 2012.